A tough day for the Vineyard squad. After 12 consecutive Island Cup victories, the Vineyard team was forced to give up its cherished trophy to a more powerful and experienced Nantucket Whalers on Saturday afternoon. With a final score of 42-0, this was the most one-sided game in the 69-year history of the inter-Island football rivalry, known since 1978 as the Island Cup. And it ended the longest winning streak either team has had against the other. 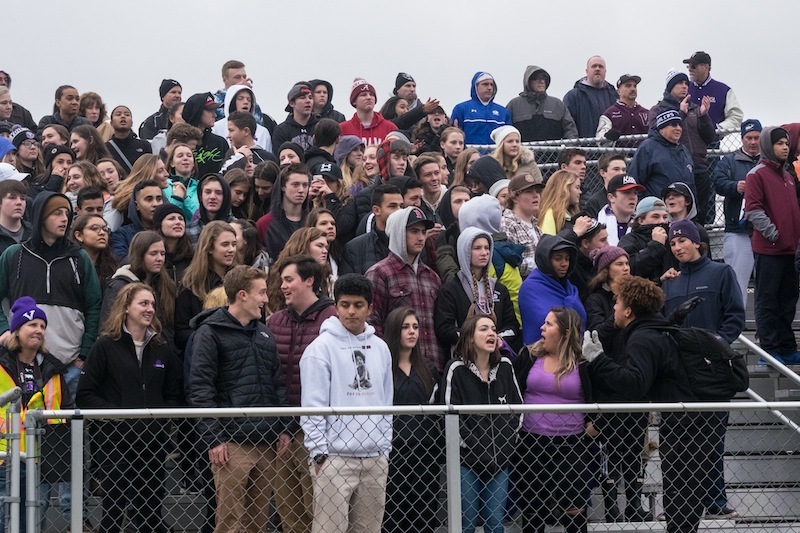 Close to 1,000 people, including about 400 Nantucket fans who traveled to the Vineyard via a special Island Cup ferry, turned out for the game under gray, occasionally showery skies. 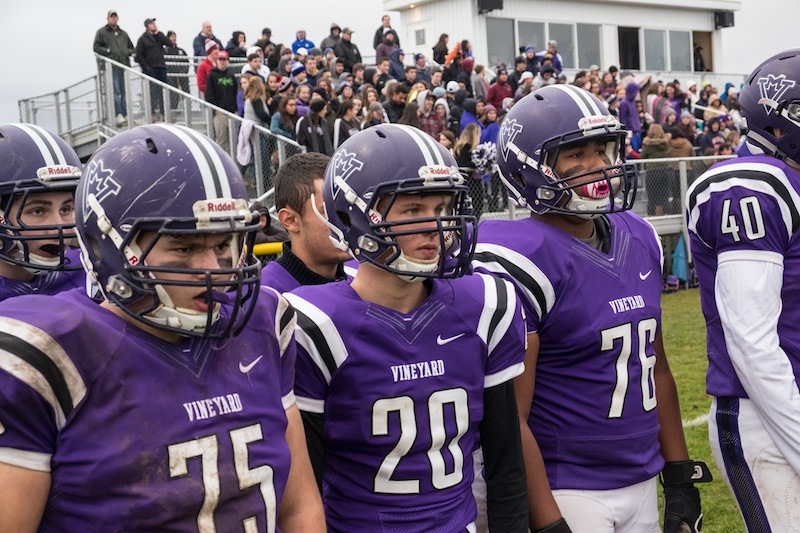 Vineyard fans rang purple cowbells as their team took the field, with emergency vehicles blaring lights and sirens. A small group of Minnesingers sang the national anthem in close harmony and Nantucket won the toss. But with the coveted silver cup glistening in the misty rain on the sidelines at Martha’s Vineyard Regional High School’s Daniel G. McCarthy Memorial Field in Oak Bluffs, Nantucket dominated early, scoring four touchdowns in the first two quarters and consistently stopping every Vineyard effort to advance. “This is like a championship boxing match,” said Bill Abramson, a veteran sportscaster who was there to help call the game for Nantucket’s radio station and capeandislandsports.com. 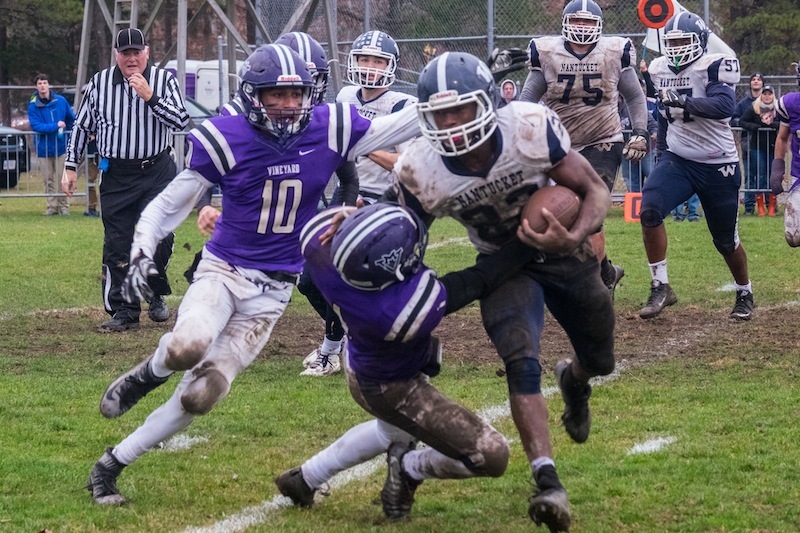 But before long, it began to feel more like a merciless drubbing as the Whalers kept the Vineyard scoreless while racking up a total of six touchdowns by the end of the game. Halfway through the second quarter, Vineyard junior Zach Moreis went down hard and spent several minutes on his back before leaving the field without assistance. He was back on the field after halftime. As the clock ran out, Nantucket fans cheered and the cup was turned over to the Whalers for the first time since 2002. The Vineyard leads overall in Island Cup victories, 19-18. For the Vineyard, it was Stephen McCarthy’s first Island Cup as head coach (he had seen action as a player in the 1970s) taking over from Don Herman, who retired after 28 years at the helm. Mr. McCarthy has had a tough first year with a young team plagued by injuries, winning just one game since the season began. Nantucket coach Brian Ryder is in his third year as head coach. His strong, seasoned squad was 8-3 overall for the season, and included his son Cory, a 6’4”, 290-pound senior who has committed to play football on scholarship at Holy Cross. 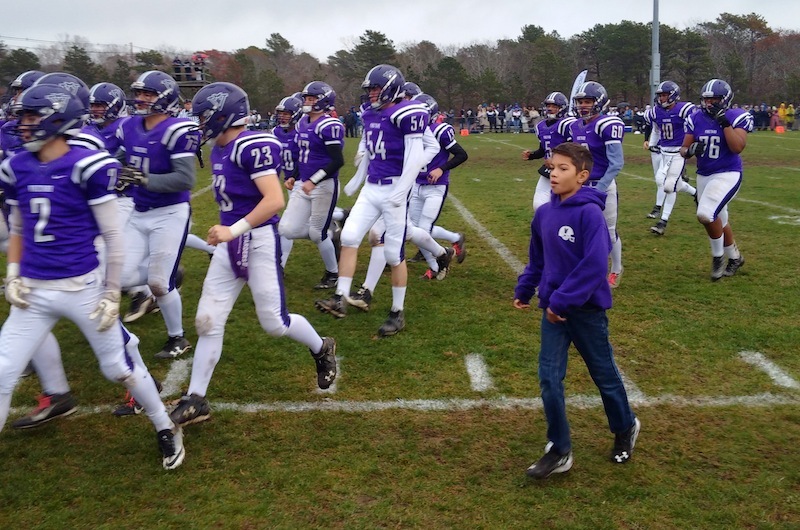 Mr. Herman was in the stands Saturday and he knew what the Vineyard would be dealing with, having faced Nantucket last year in an almost-scoreless game. Still, Mr. Herman sees promise in the young Vineyard squad. “They’ve got some good young talent,” he said. More photos of the Island Cup. I hope all those anti turf fanatics are happy now. Our kids didn't get to practice or play much of the season because of the deplorable field conditions. Meanwhile, Nantucket was able to raise their game to a new level because they have the finest field and facilities in this part of the state. I hope you are all real proud of how you held back our kids for your petty "environmental" worries. AstroTurf equals success. We could use a bit of that on this island. Whining about the field as the cause of a loss is really poor. First loss in twelve years, yeah grass is really holding us back. Get a grip.....does anyone remember that this is a GAME????? What a great example of fine sportsmanship, Wild Pitch. And posting anonymously also is a wonderful show of courage in your convictions. You’re just the role model our amazing young athletes need. That field has seen more success and more wins than almost any school our size. All we need to do is maintain it properly, which will be cheaper and healthier for everyone. Wow! Great sports reporting. Sad to hear the Vibeyarders were stove by a Whale. Tough for our guys, but remember that a great rivalry can only stay great this way. Congratulations Whalers. But we’ll see you next year. Fear the Wrath! I graduated from Nantucket many years ago- I was fortunate enough to participate in this rivalry. Glad to see the Whalers bounce back! I have full confidence in Brian Ryder as a coach! The guy played linebacker at Tulane and even had a brief stint with the Patriots! Whaler Pride baby! The whalers are just more dominant than the vineyard on all levels. Bigger, faster, and stronger. Huge win for Nantucket. 42-0 shows that they wanted the cup more and put the work in to get it. I don't see the vineyard having a chance the next 10 years. The cup will stay where it belongs for a very long time to come. And.... Pray they will play on synthetic turf!! !